FEATURES * 2 ranges : 2,000 uS, 20 mS. * Temperature measurement, ℃/℉ * Automatic temperature compensation. * Probe with the meter, all in one. * Carbon rode electrode, high reliability. * Data hold, Record ( max., min. ). 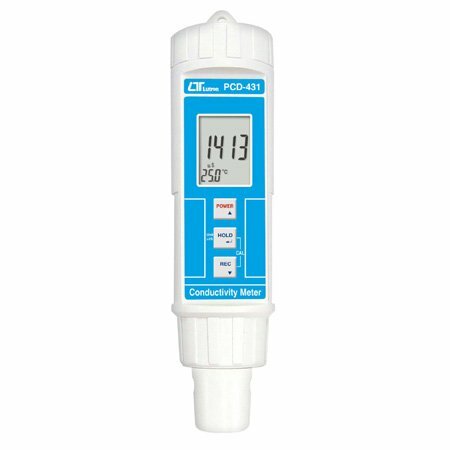 * IP-67 Water resistance, heavy duty. * External calibration buttons. * DC 1.5V battery ( UM-4, AAA ) x 4. FEATURES * 4 rings conductivity probe, high performance, wide range, professional. * 4 ranges : 200 uS, 2 mS, 20 mS, 200 mS. * Separate electrode, easy operation. * The portable conductivity meter provides fast, accurate readings, with digital readability and the convenience of a remote probe separately. * All function keys are used the rubber button. * Data hold. * Used the durable, long-lasting components, including a strong, light weight ABS-plastic housing case. * Wide applications: water conditioning, aquariums, beverage, fish hatcheries, food processing, photography, laboratory, paper industry, plating industry, quality control, school & college. FEATURES * Pocket size, easy to carry out. * Separate electrode, easy operation. * The portable conductivity meter provides fast, accurate readings, with digital readability and the convenience of a remote probe separately. * Two measuring ranges : 2 mS, 20 mS. * LCD display for low power consumption & clear read-out even in bright ambient light condition. * Durable, long-lasting components, including a strong, light weight ABS-plastic housing case. * Built-in Low battery indicator. * Wide applications: water conditioning, aquariums, beverage, fish hatcheries, food processing, photography, laboratory, paper industry, plating industry, quality control, school & college. FEATURES * Range : 200 uS/2 mS/20 mS/200 mS. * Automatic temp. compensation, ATC factor adjustment. * Carbon rod electrode for long life. * Max., Min., Data hold. * RS-232 computer interface * Jumbo LCD display, unit with dot matrix LCD. * DC 1.5V ( UM-3, AA ) x 4 PCs or DC 9V adapter in. * Size : 203 x 76 x 38 mm.